Controversial Dutch politician expresses hope for alliance with UKIP and FN - despite serious allegations of anti-Semitism. Dutch populist Geert Wilders said Wednesday he still hopes to bring Britain's anti-EU leader Nigel Farage into an alliance with France's Marine Le Pen despite her party's perceived anti-Semitism. Anti-immigration and anti-Brussels politician Wilders said it was still possible that Farage's United Kingdom Independence Party (UKIP) and Le Pen's National Front (FN) could join forces after next week's European parliamentary elections. "I hope to play a role after the elections as well," Wilders told the Dutch Foreign Correspondents' Association (BPV) in The Hague. "If it could be helpful that after the elections I could try and bring them (Farage and Le Pen) together... I would certainly be willing to so," the eurosceptic said. The anti-Islam Wilders and French far-right leader Le Pen late last year announced what they called a "historic" alliance to fight the European elections and form a bloc in Brussels. UKIP leader Farage, whose party is predicted to comfortably beat its current nine seats in next week's election, has however repeatedly ruled out an alliance with the FN, saying the French party was too tainted by anti-Semitism. The FN's founder and honorary president Jean-Marie Le Pen, Marine Le Pen's father, has been convicted of hate-speech and Holocaust denial. "It will be a very sad thing if we're not able to work together. I hope they can bridge their differences," Wilders said. Le Pen has accused the outspoken Farage of double standards over his continued refusal to ally with the FN in Brussels, opting instead for the fringe eurosceptic Debout la Republique (Stand Up The Republic), led by Nicolas Dupont-Aignan. Wilders said he also hoped "after the elections he (Farage) might have more room to work with us." Le Pen, Farage and Wilders' parties are riding high ahead of the vote, according to AFP, with the FN hoping to win as many as 20 seats from its current three. 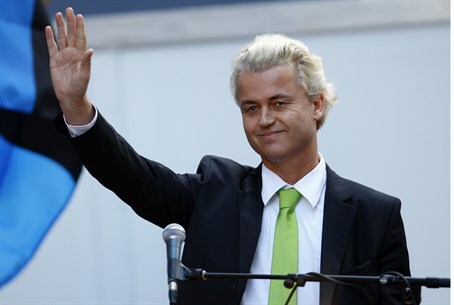 Wilders's Party for Freedom (PVV) was set to score around five. In order to form a far-right anti-European bloc, Wilders and Le Pen would have to find like-minded politicians in at least a quarter of the EU's 28 member states and see 25 members elected to the now trimmed-down 751-seat European Parliament.